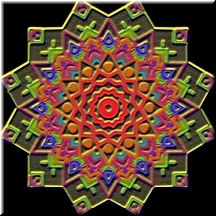 The Flatland Digital Artwork Clip Art Gallery: Meditation Garden. I got a bit obsessed creating mandalas using metallic effects. 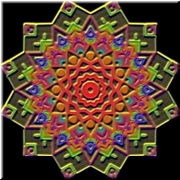 It's a 20-pointed star on a black background with a red sunburst in the center and intricate details---leaves, flower petals, flames, whatever you want to see, in bronze, green, teal, purple and indigo. Brilliant and intense colors, lots of detail.